healthy breakfast recipes. 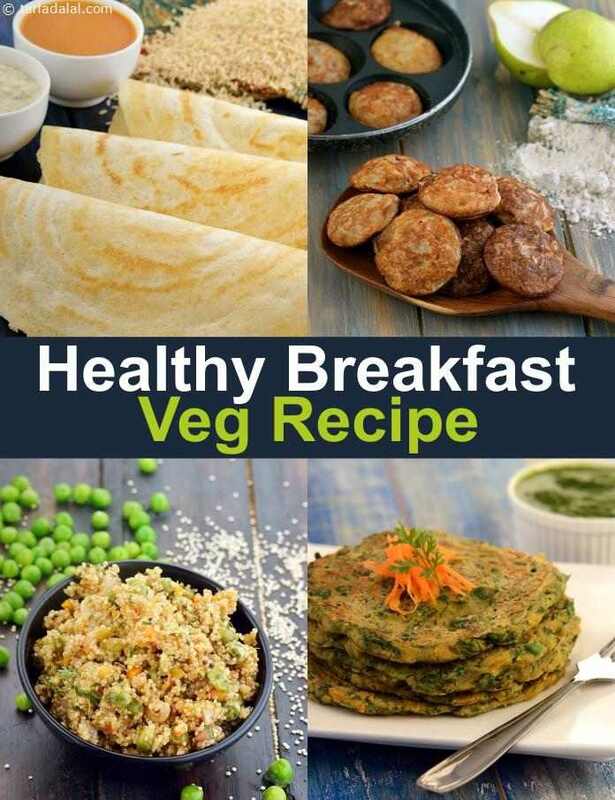 healthy breakfast Indian recipes, ideas. We all know that breakfast is a meal that cannot be skipped, and of course no meal is as satisfying as a tasty and healthy breakfast. However, preparing breakfast in the bustle of the busy mornings can be a real sore point for most people! Lack of time often makes them revert to the same old dishes every day, opt for packaged cereals, or worst, skip breakfast itself. This section of Healthy Breakfast Recipes will surely change this scenario. It is packed with really scrumptious breakfast ideas, which are not only tasty and nutritious enough to pep up your whole day, but also made using commonly-available ingredients to make your work simple and quick. Care has been taken to use low-fat ingredients and to avoid processed and refined food products. From elaborate to jhat-pat recipes, and options that suit all age groups, you are sure to find just what you want in here. You really want to try and eat healthy through the day. So it's crucial to remove refined foods from your food like rava, maida, white bread, cornflour. So always look at the ingredients going into your food. Also you best bet is to make your breakfast at home. You know what is going in and its made fresh. See our list of items which should be included in a healthy breakfast. Enjoy a range Paneer Dill Toast to Oats Moong Toast all made with whole wheat bread or brown bread. Check here for our Healthy Breakfast Sandwiches entire list. We all love Parathas and its an Indian favourite. We provide you some parathas which are made of whole wheat like Green Peas Parathas . Then there is a Soya basesd Minty Soya paratha which is high in Iron and Folic Acid. More Healthy Parathas here. Enjoy the Brown Rice Dosa with some Sambar. Then there is the innovative Moong Dal Spinach Idli with some healthy chutney. You can try our healthy Juices and Smoothies to kick start your morning. Follow this with Upma or some Oats recipes. Enjoy our healthy breakfast recipes. healthy breakfast Indian recipes, ideas and other healthy breakfast articles below. Apple cinammon and oats recipe is a great healthy quick breakfast recipe. Oats are a top 10 food group to eat as they contain complex carbs. .
Fibre-rich apples and juicy cucumber make a light and invigorating juice that helps to detoxify the body and keep your skin glowing all day! Tarla Dalal Hi, Happy to know you liked the recipe collection. Do try the recipes and share with us your feedback. Happy Cooking!